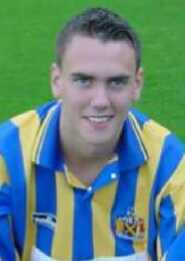 Central defender whose career began with Luton Town before joining St Albans City in 1999. During his first spell at Clarence Park he played in the 1st Round of the FA Cup, the 4th Round of the FA Trophy and collected a Herts Senior Cup winners medal, was also voted Player of the Year for 2000-01. After leaving the Saints he spent seven years with Boreham Wood and one with Braintree Town. Returned to St Albans from the Wood during the 2011/12 close season and made his 150th appearance during September 2011. Sadly passed away at the age of 31 after a long illness.